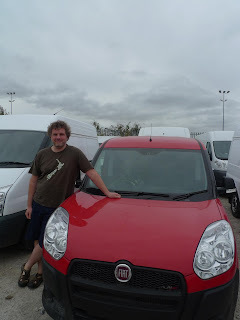 A customer from New Zealand has travelled 11,000 miles (17,702km) just to by a Fiat Doblò commercial van from a major car supermarket. Former British resident, Dan Love, 45, from Central Otago, New Zealand, bought the vehicle as it was cheaper to buy abroad than it would be from New Zealand. Love said taking the necessary paperwork, flights, and export costs, into account, he still saved money. Love's Doblò Cargo short wheelbase is powered by Fiat's 1.6 MultiJet diesel engine and came with 55 miles (89km) on the clock. He paid £7,299 (€8,370/$12,000), saving £7,081 (€8,120/$11,600) over the recommend retail price (RRP).